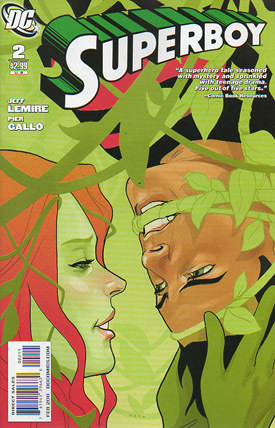 "Smallville Attacks - Part Two"
Smallville is suffocating under a mass of plant life and Superboy is not happy, especially when he sees Poison Ivy in front of him. Despite her plea that she isn't to blame, Conner is still on the offensive and Krypto isn't too trusting either. Simon however points out that if Ivy were lying surely with Conner weakened by his Parasite battle she could use her powers to destroy them all. Against his better judgement Conner agrees to help a seemingly de-powered Pamela Isley leaving Simon and Krypto behind to watch over Parasite till police arrive. Simon agrees but is disappointed Conner doesn't see his potential as a back up so sets up "Project Purple Haze" sampling Parasite's DNA and leaving Krypto on watch while he begins experimenting. Meanwhile Ivy, with the last of her powers, is guiding Conner to the source, through scores of mass vegetation they finally arrive at Mr. Gilliam's farm. Untouched by the crops it's deathly silent and when they break open a barn door they make a horrifying discovery. Gilliam, a timer and some kind of scanner orb made of alien technology and tractor parts that are all entwined around, and in, Gilliam's body. Simon has been studying the Parasite DNA and discovered that it has the ability to graft itself onto any tissue it comes into contact with. Naturally Simon turns to his beloved frogs for an answer and "Project Purple Haze" begins. Back in the barn Gilliam can only utter "Hollow" and "Broken Silo" as words of help to Conner who struggles with removing the symbiotic cabling before the timer runs out. Ivy is less compassionate and in an eruption of blood, rips out the cabling. 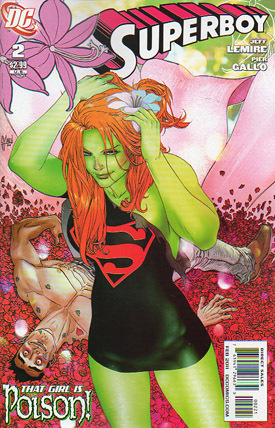 Powers 'returned' Ivy entraps Conner and reveals that whatever had Smallville in its grip had affected 'The Green' where her powers originate and had lured her to the amazing technology. Now she has the tech and a Superboy to play with nothing can stop her. Cue Simon and an army of Parasite Frogs to the rescue! Startled by the crazy attack, Ivy is quickly drained of her powers and her intoxicating influence on Conner disappears with them. With the timer about to hit zero Superboy rips the scanner 'bomb' from the barn and heads skyward ready to sacrifice himself to an explosion... that never comes. Instead, after a flash of light, the device simply dissolves, no harm done. With the plot ended, the crops retreat back into the earth and to Krypto's dismay, they take Parasite with them. Gilliam is alive thanks to Simon, but very weak and Ivy is unconscious. Searching the barn they come across part of a tablet that neither Simon, nor Conner can decipher. No time for mysteries, Conner takes Gilliam to the hospital, Ivy to Metropolis and vows to rebuild Smallville's damaged landscape. Story - 5: Superboy, Krypto, Simon and writer Jeff Lemire are going full speed ahead with a supernatural mystery that is so fresh, funny and fun all at the same time - it's a formula that is a vibrant and attractive mix. The weirdness of Poison Ivy walking all the way from Gotham to Kansas is explained away easily, something that was an uneasy climax to last issue. Simon proved he was far from a 'supporting character' and he brought in Parasite Frogs! I can't find fault, because I was looking forward to this issue so much after the first and it delivered everything in spades; so much that I eagerly await next issue. I enjoy the fact that Lemire can happily balance character, action, comedy and mystery in a way that's very reminiscent of the Supergirl/Linda Danvers book. Exploring new techniques and arcs for a character that literally was written to death is a very difficult task and one that seems to be onto a fantastic start. Art - 5: What can I say that I didn't say last month? Well, I can have a tiny whinge - not about the art - but about paper quality. The book really needs to be on better paper stock, I found that some of the lush pencil work and subtle expressions, which is quickly becoming a staple in the book, really suffers as the paper seems to blur the artwork. Otherwise great stuff! I can see many a man googly eyed over Ivy's sultry portrayal and how can you not love Parasite Frogs! Cover Art - 5: Phil Noto's strength has always been his character focus, what better way to showcase that than to close in on the faces of the Ivy and Conner. I flipped it 180 degrees just to see the anger in Conner's face then back again to see Ivy's feminine charm. A really nice cover this month! Cover Art (Variant Cover) - 1: Ugh! Poison Ivy is all about seduction. The idea of intoxication to desire. Here it just comes across as dirty.